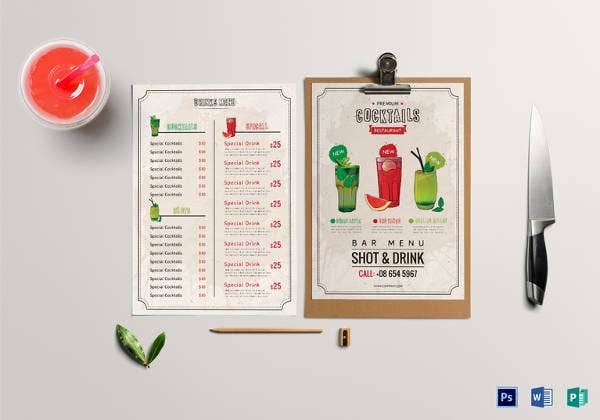 Drink Menu Templates – 30+ Free PSD, EPS Documents Download! Drinking is a hobby for some while there are others that pursue it even more passionately. 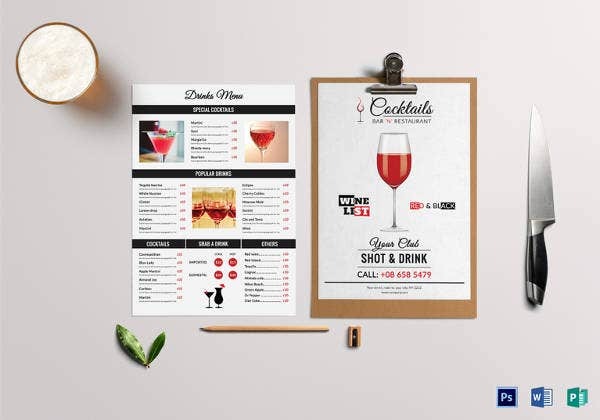 If you’re a bar or pub owner who serves really good wine to the crowds, then you also need to have a drinks menu which reflects the spirits similarly – no pun intended. 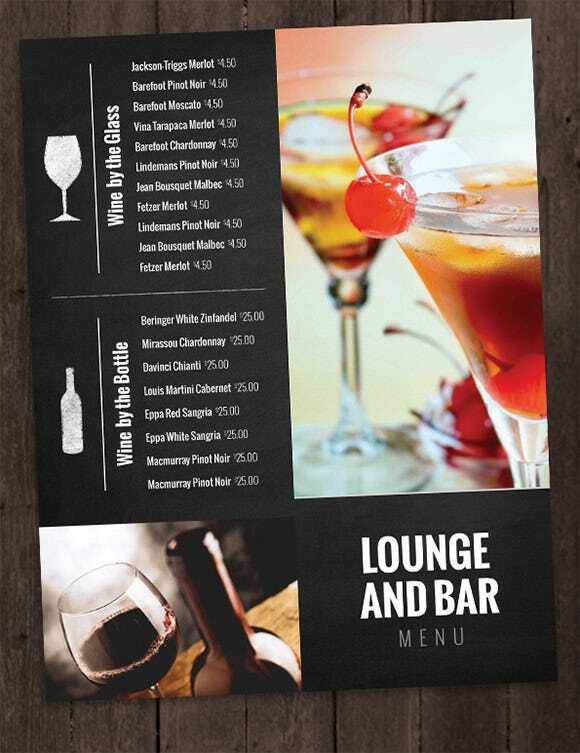 Regardless of whether you serve branded wine or not, your drinks menu ought to look awesome. 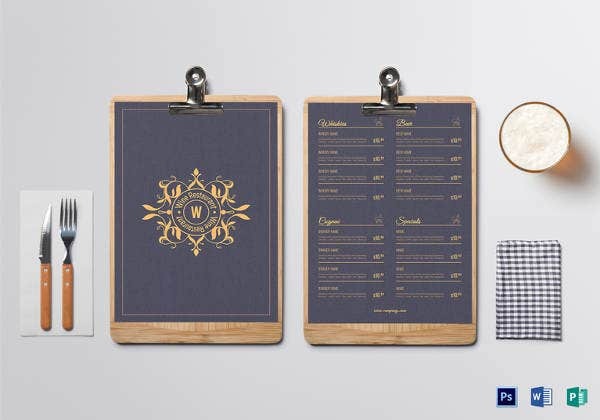 You could put your faith in Drinks menu PSD templates. They are easy to customize and use! 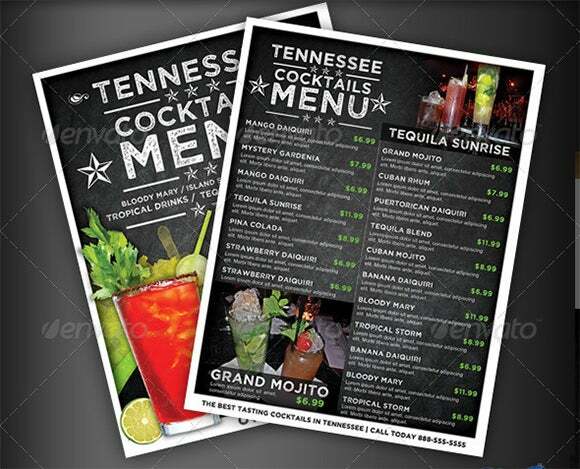 Buy Now When your staff shows the drinking menu to your customers they must find their brand in that. Also, that has to be more captivating. 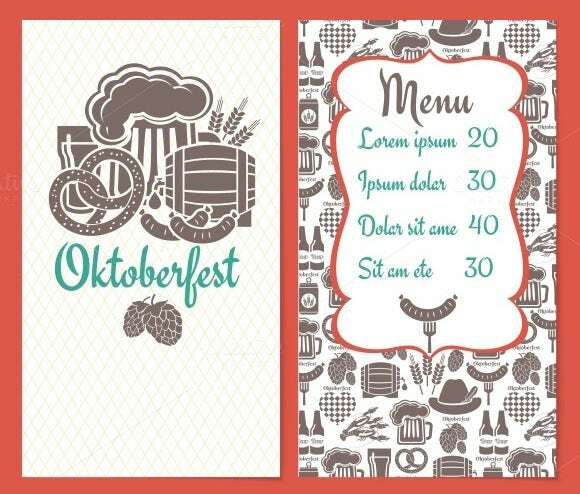 Now, you need not to worry about your menu presentations. 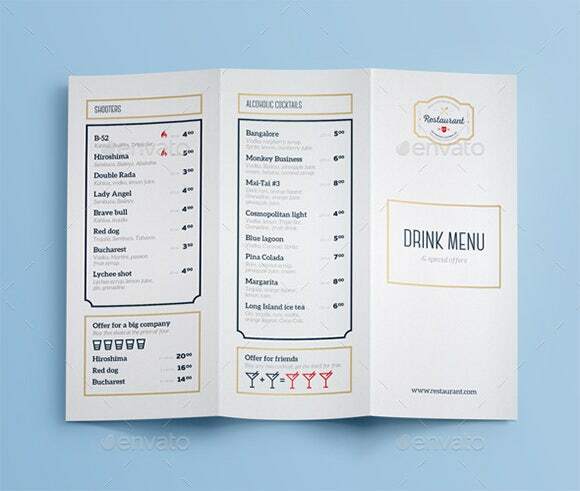 Our drink menu template will surely assist you in enchaining your customers. 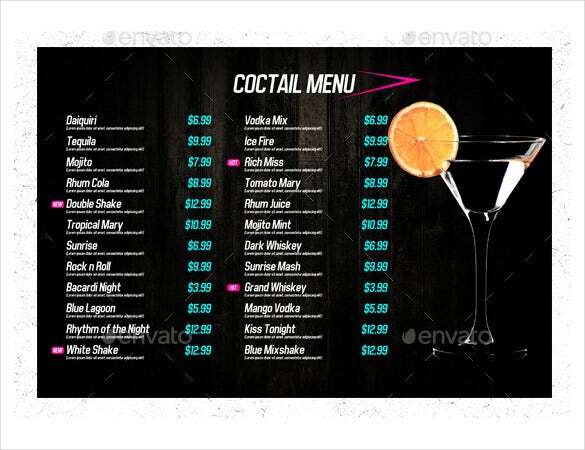 Use it and enjoy the features.The drink menu template is amazingly easy to use. You can use it on your device as it is available online Bar Menu. 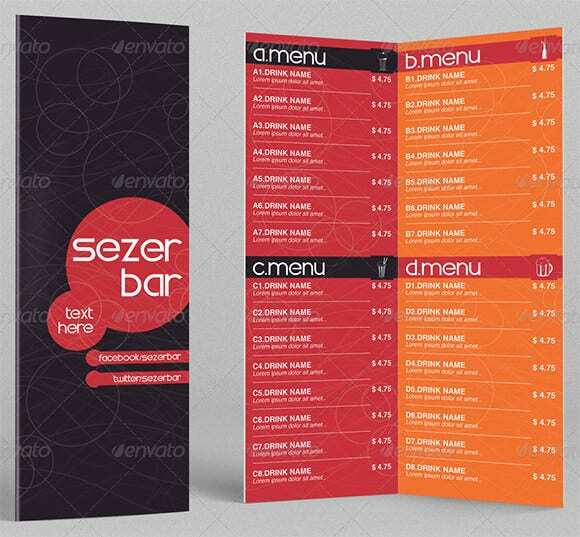 These Menu Templates is used for getting various designs and their color variations to be chosen of your choice. 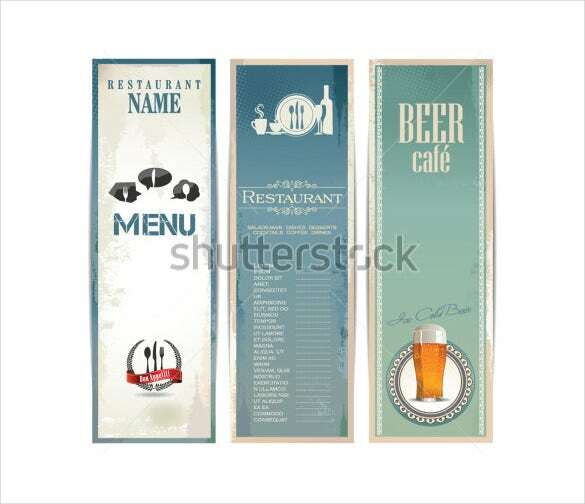 It has got unique and really attractive designs and templates. 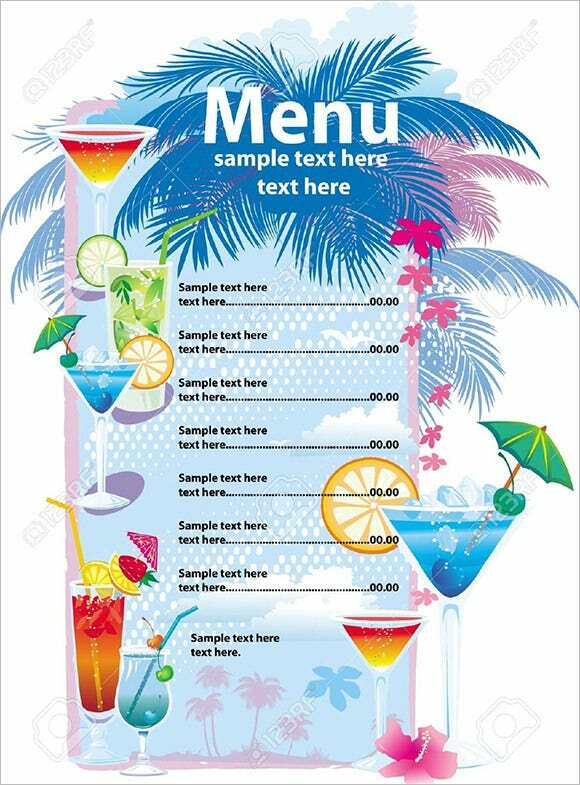 This PDF menu is for couples who have differentiated opinions on the drinks to be served on their wedding. 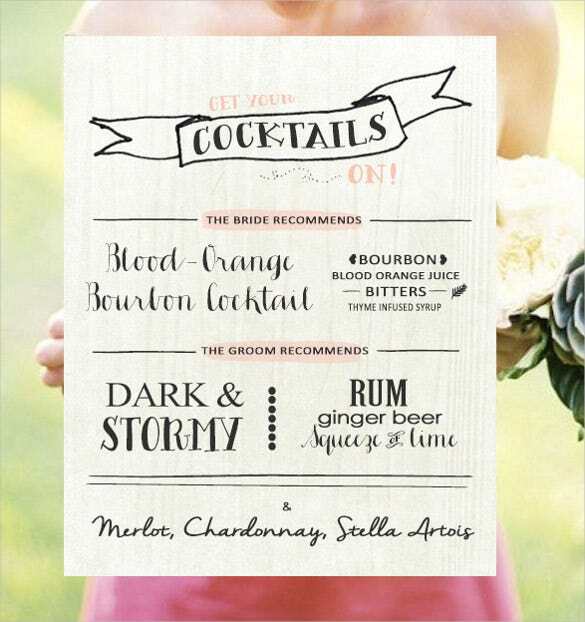 This menu has a big ‘cocktails’ sign and divides into what the groom and bride would want you to have. 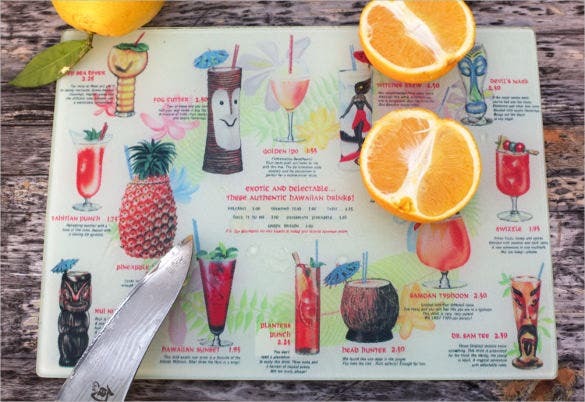 This word Hawaiian drinks menu that are given in different pictures like coconut, pineapple wine glass and others. 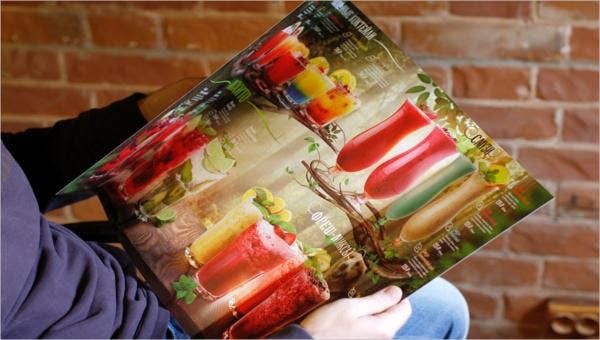 The menu also showcases their culture with a picture of an idol you can drink from. 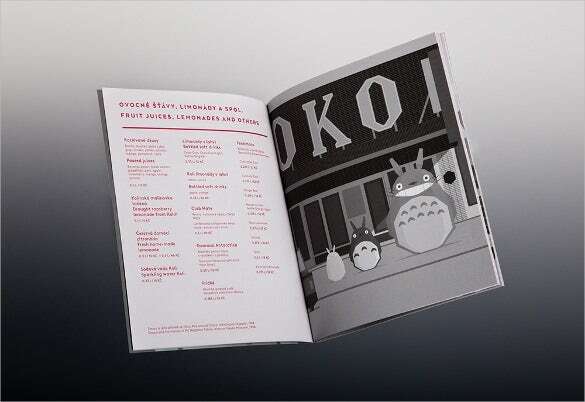 The menu shows a bi-page menu that has red writings on one side and cartoon characters in black and white on the other side. This excel file menu is preferably for animation lovers and kids. 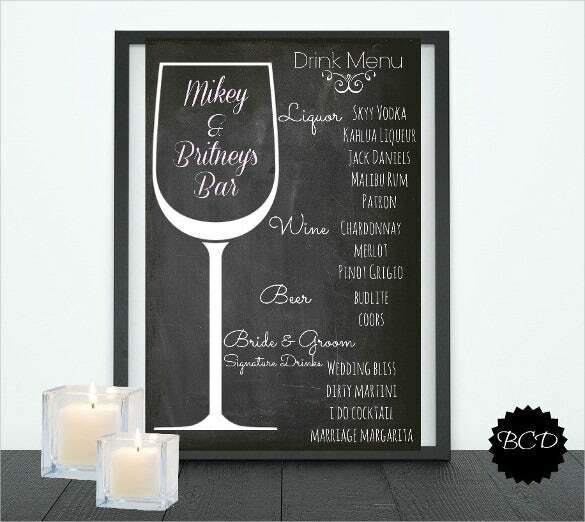 The menu has the name of the couples to wed in a wine glass to indicate it is a drink menu. 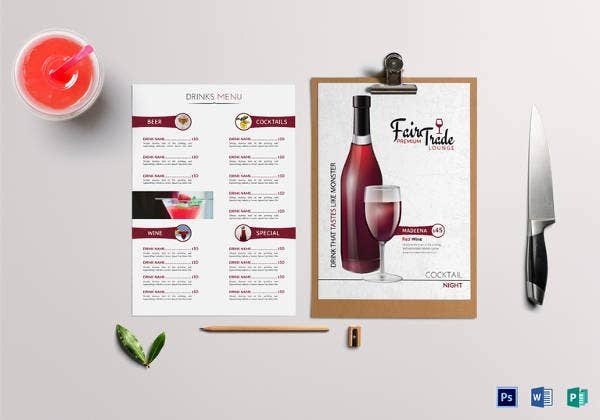 The PDF menu displays a wide range of drinks like liquor, wines and beer it also has the couples signature. 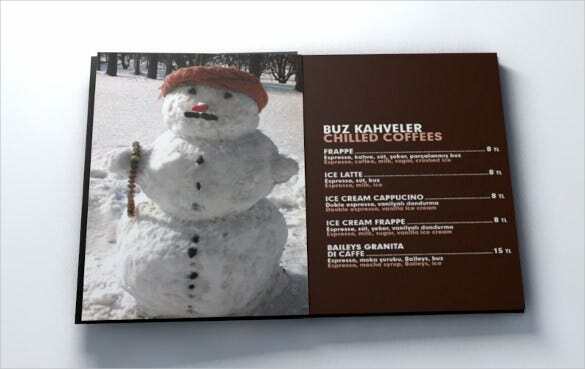 This menu, a word coffee menu, is used in the winter as it shows an ice man with a turban on its head. The other side is brown displaying coffee like, frappe, ice latte, ice cream and cappuccino. The menus are in gold and dark chocolate colors. 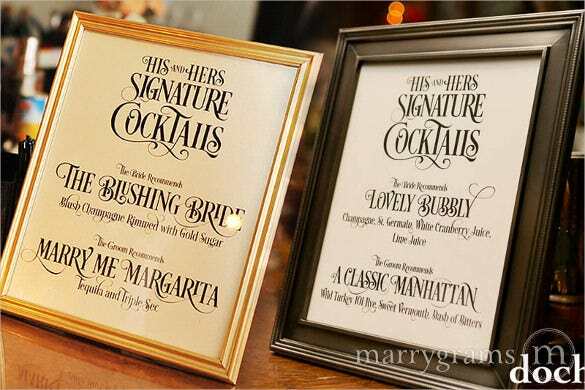 The excel menus are for cocktail for the brides and grooms wedding displaying on each of them what each desires the guests to have in the party. 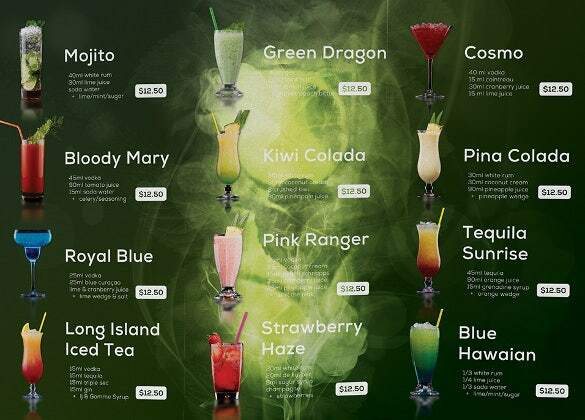 The PDF menu displays different drinks like mojito, bloody Mary, royal blue, pink ranger, pina calada and Cosmo. 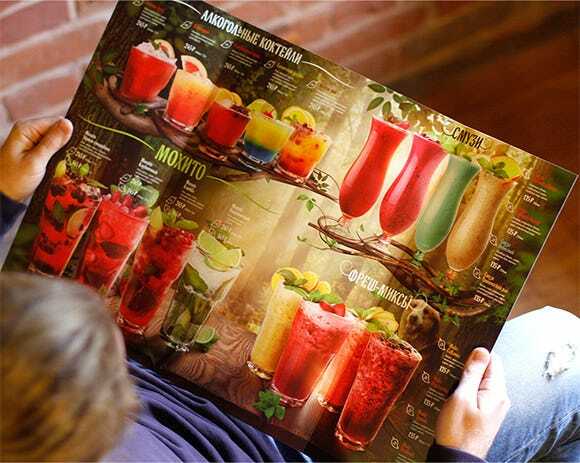 The drinks have relative pictures of the drinks in glasses for the customer to get a look at what it looks like. 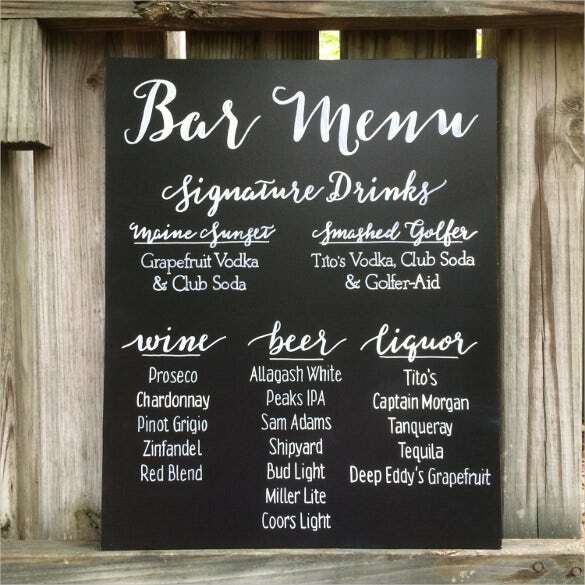 This menu displays a hand written chalkboard for a bar. 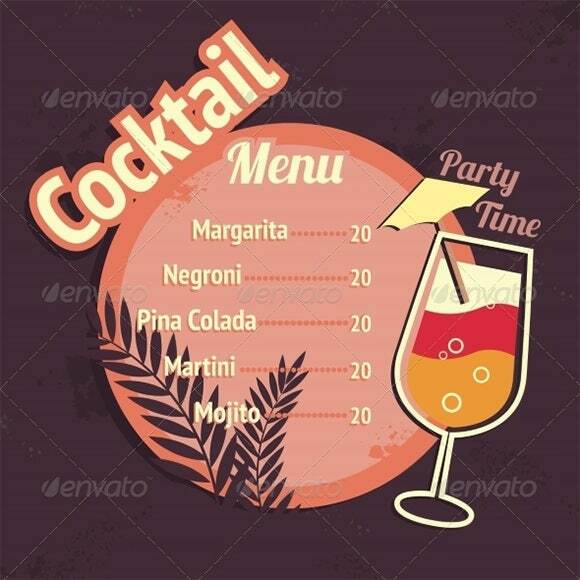 The word menu displays signature drinks on the top then followed by wine, beer and liquor offered in the bar and it is easy to update the menu. 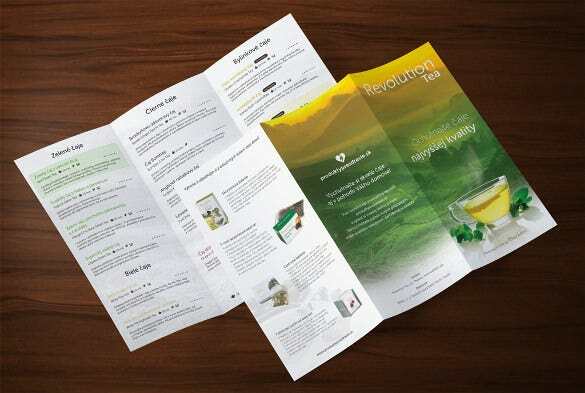 The excel template shows a three page menu for tea the cover page is adorned by yellow and green with a glass of tea at the bottom. The inner page display the various type of tea offered in the premises. 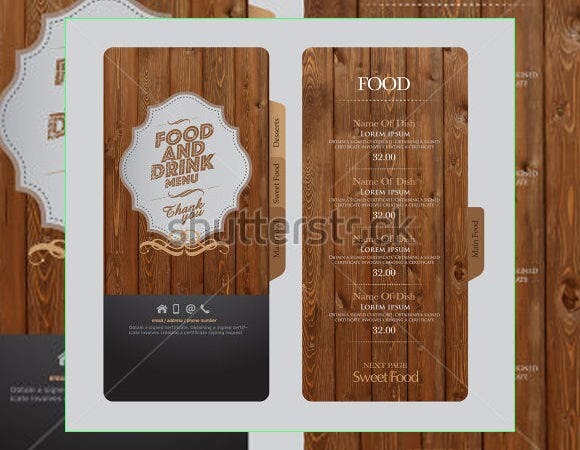 This is for couple wedding in Halloween this menu is for you. 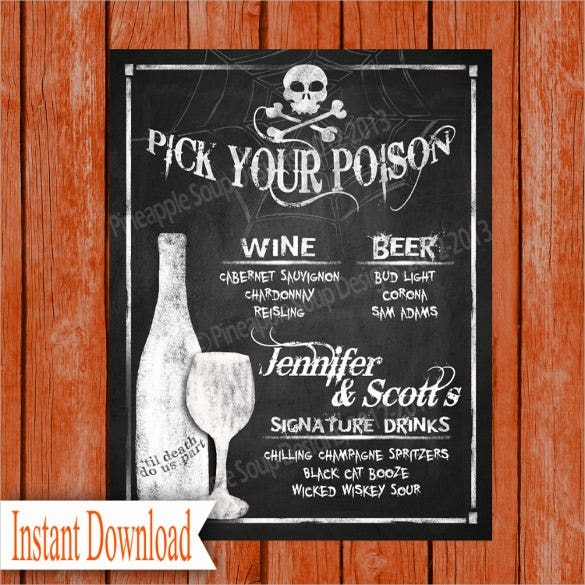 The word menu shows a skull on the top with a sign that says ‘pick your poison’ followed by the beer, wine and signature drinks of the couple offered. 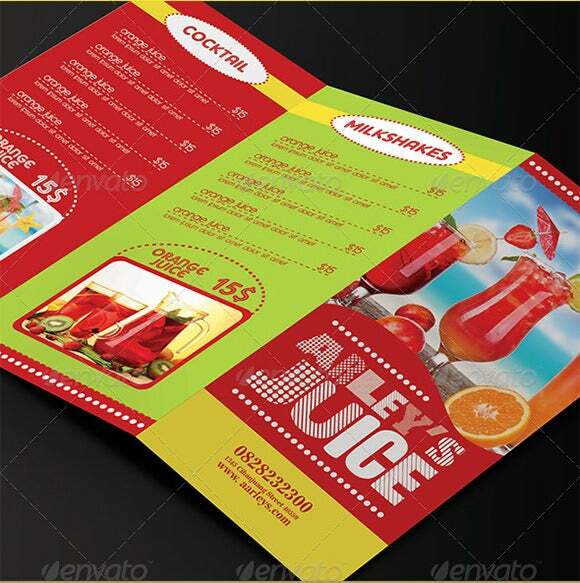 All you have to do is to upload your brands list and type of drink. 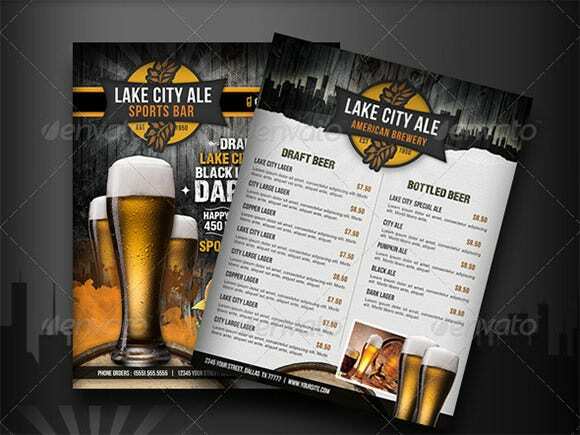 Once it is done, you will be provided with a number of designs. 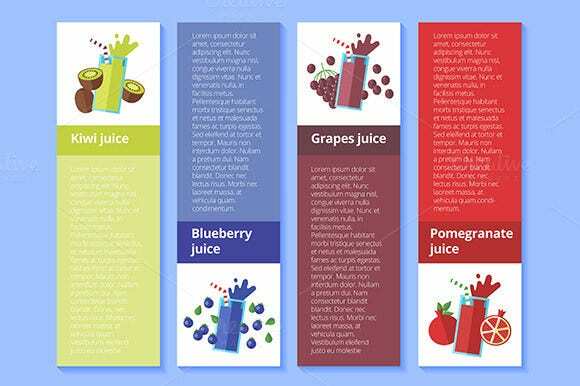 You can chose one and use that for your menu.Smart people always choose the smart way to work. 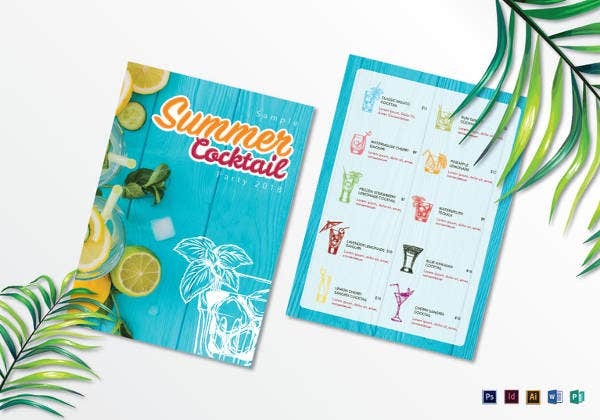 Using drink menu template makes your customers happy by seeing the perfect presentation of their chosen brand and hence, making you smarter professional.